Pain in the back of the heel is one of the most frequent manifestations of plantar fasciitis. 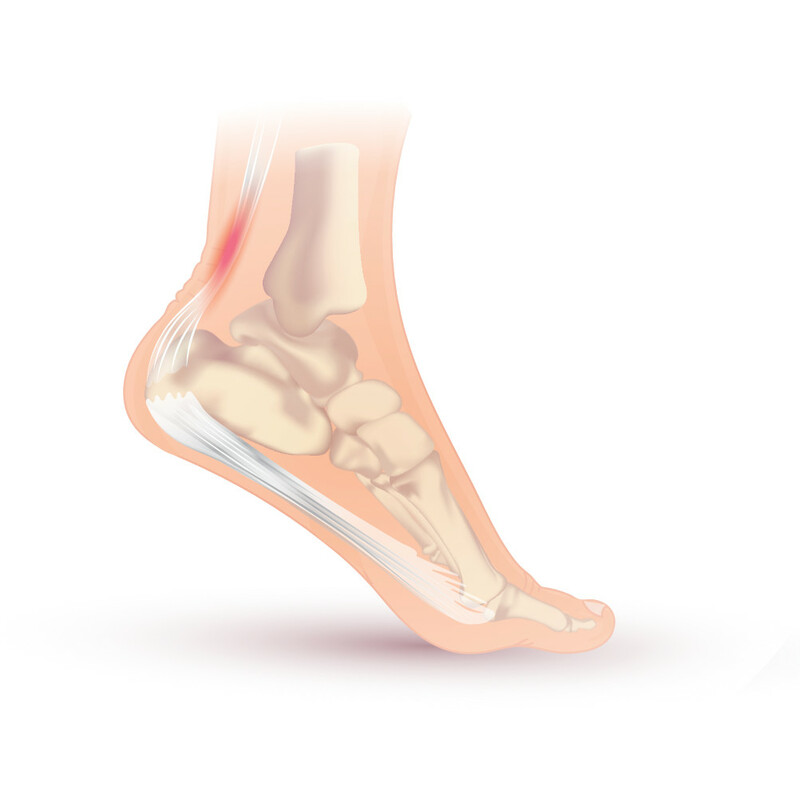 This condition occurs when the plantar fascia, a fibrous band of connective tissue connecting the heel bone to the front of the foot, becomes inflamed. Apart from plantar fasciitis, plantar heel pain can be caused by stress fractures, nerve compression and rheumatologic conditions, such as psoriatic arthritis, rheumatoid arthritis and osteoarthritis. The causes of pain in the heel can be split into three different categories: mechanical, neurologic, and rheumatologic. This category includes acute problems caused by wear and tear or other external factors such as the rupture of the plantar fascia due to trauma or sports injuries (athletic competitions). This category also includes degenerative conditions, such as plantar fasciitis and calcaneal stress fractures. A degenerative condition is defined as a progressive disorder that will continue to worsen, especially if no treatment measures are taken. There are often exacerbated by other intrinsic factors, such as excess foot pronation due to a particular walking gait or running style, and shortened Achilles tendons. In addition, inflammation can also be triggered by extrinsic factors like inadequate footwear or regular high impact physical exercise. plantar fasciitis accounts for around 80% of all cases of heel pain. Due to a number of factors, including increased tensile load and repeated trauma to the feet, the plantar fascia becomes inflamed and irritated. Typically, this type of heel pain tends to be worse in the morning shortly after waking or after long periods of inactivity. Targeted physical exercises constitute an effective treatment solution for the symptoms caused by the inflammation of the plantar fascia. During the acute phase, any sort of movements performed should aim to reduce inflammation and provide relief from the pain. As initial symptomatology improves, so the goal of rehabilitation will change from pain relief to improving the range of motion in the affected foot. Movement exercises designed to increase flexibility levels are most effective at this point in the recovery process. Targeted physical exercises aimed at helping one to regain foot stability can also be useful, thereby improving balance overall and preventing the likelihood of future falls or injuries due to twists or sprains. Once one has regained both physiological range of motion and core stability, the focus should shift towards exercises that can strengthen local muscles in and around the foot. Stretching exercises complete the rehabilitation program. These will help to prevent any future damage to the plantar fascia and ensure that the healing process is completely successful. Test if you are ready to start rehabilitating your foot with the screening tool on our plantar fasciitis info page. This condition can be defined as a type of ‘overuse’ injury, which results in the Achilles tendon becoming irritated and inflamed (causing pain in the back of the leg, amongst other symptoms). This particular combination of pain and inflammation tends to impair overall performance, and is associated with an increased risk of tendon rupture. Inflammation of the Achilles tendon is almost always accompanied by intermittent, sharp pain in the posterior heel area. It is important to remember that the pain becomes worse when one is active or when pressure is applied to the area. Moreover, the Achilles tendon is usually tender (even thickened in some cases) upon palpation. Controlled movements, such as those found in eccentric exercises, are recommended for this type of injury. Orthotic devices, including heel lifts, can also be very effective at improving overall symptoms. During the acute period, however, it is imperative that pressure on the affected tendon is reduced. Find out more about more how to treat an inflamed Achilles tendon here. Test if you are ready to start rehabilitating your foot with the screening tool on our achilles tendonitis info page. One of the most common fractures that can occur at the level of the foot, this condition primarily occurs in athletes, often as a result of repeated stress (hence the name) on the bones of the feet. It can also arise in cases of prolonged weight bearing or as a result of walking on hard surfaces. Pain becomes worse with activity but is also present at rest. 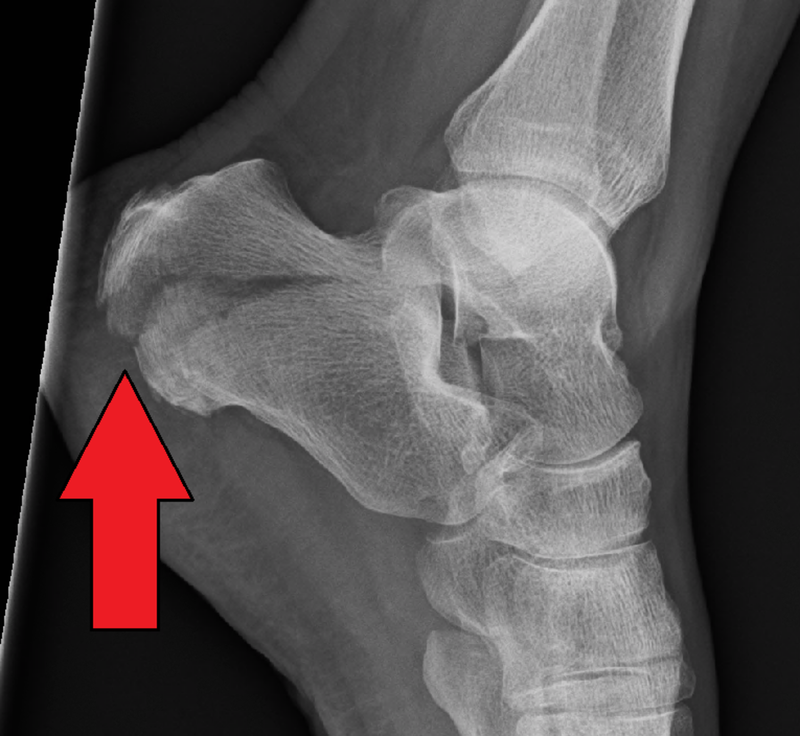 When the calcaneus, which is the biggest bone in the foot, is subjected to repetitive stress (either as a result of prolonged mechanical loading or due to structural fatigue, as tends to happen with athletes), then bone strain and fractures can occur (as seen in the image above). This typically results in pain in the heal area. The higher the level of strain, the larger the risk of damage becomes. Fracturing will occur when the bone can no longer withstand any further mechanical loading, structural fatigue or both. Not all pain or injury is caused by mechanical injury to the muscle and bones. Sometimes the root cause can lie within the nervous system itself, nerve compression being the predominant issue. When one or several nerves are compressed or entrapped, irritation, pain and other symptoms can follow, including sensory disturbances. Sensory disturbances relates to abnormal sensations that sometimes occur because of nerve compression or entrapment. For example, if the tibial nerve is compressed (as happens in tarsal tunnel syndrome), patients can experience excess sensitivity in the sole of the foot. One can also experience a reduction in sweat production, as well as burning pains or stinging sensations. These manifestations occur when the sensory part of the nerve is affected. This is a medical condition similar to carpal tunnel syndrome (which occurs in the wrist) in which the posterior tibial nerve in the ankle suffers from damage, often as a result of extrinsic factors such as repeated pressure or compression. For example, those who have suffered crush injuries can develop this syndrome. 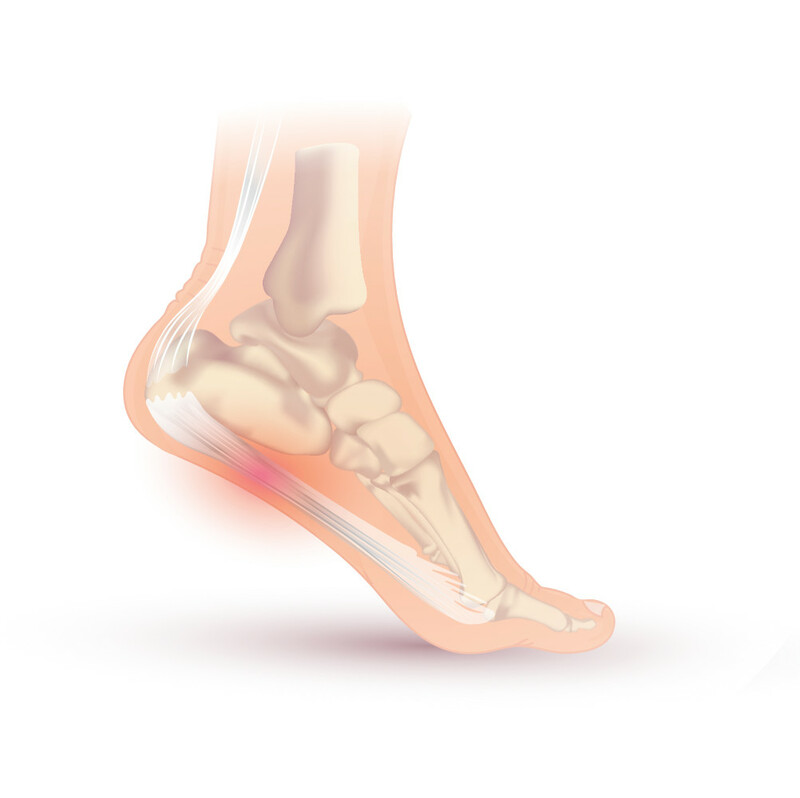 Typical symptoms of tarsal tunnel syndrome include plantar heel pain due to compression of the posterior tibial nerve. It is also possible to experience tingling, numbness or burning sensations in the ankle or heel. Less frequently, there may be other symptoms such as shooting pains and sensations similar to an electric shock. The first line of treatment for tarsal tunnel syndrome should be physical rest and cold applications (ice packs). NSAIDs (anti-inflammatories) can also help to provide pain relief, while targeted physical exercises are recommended to restore normal quality of life. Peripheral neuropathy can be defined as a medical condition in which the peripheral nerves suffer from damage as a side effect of wider health problems like diabetes, rheumatoid arthritis or acute trauma. Over time, these nerves begin to malfunction, leading to sensory disturbances, loss of coordination and muscle weakness. This type of neuropathy is often found in patients who suffer from pre-existing conditions or systemic diseases like diabetes. High levels of glucose leads to nerve damage, which, in turn, can cause other symptoms such as the plantar heel pain. Physical exercises and water therapy are recommended for the treatment of heel pain associated with peripheral neuropathy. In general, one has to perform low-impact exercises, so as not to aggravate any extant nerve damage. When plantar heel pain is accompanied by other joint symptoms and there is a history of rheumatologic problems, then the cause of the pain needs to be investigated further using diagnostic tools such as imaging studies and laboratory tests. Rheumatoid arthritis is an autoimmune, inflammatory condition, in which the body’s immune system attacks the joints, eventually leading to progressive bone and joint damage, accompanied by generalized and often constant pain, inflammation and stiffness. Inevitably, this leads to an overall loss of function and reduced mobility, which ultimately affects quality of life. In patients who suffer from rheumatoid arthritis, the joints of the foot are usually the first to be affected. Cartilage tears and any subsequent joint erosion can lead to plantar heel pain, as well as inflammation, stiffness and activity restriction. People will usually experience walking difficulties, especially in the morning, with the condition gradually worsening with the passing of time. In the majority of cases, the pain in the back of the heel is a symptom of plantar fasciitis, often brought about via mechanical stressors. In this case, the most effective treatment is targeted exercises, which you can read more about here However, as has been outlined above, occasionally heel pain is the result of more serious neurologic and/or rheumatologic conditions. Correct diagnosis is essential for determining the most appropriate treatment plan in order to ensure the best outcome. This is why it's always important to consult a medical expert before starting any treatment. IJSPT / Why Are Eccentric Exercises Effective For Achilles Tendinopathy?